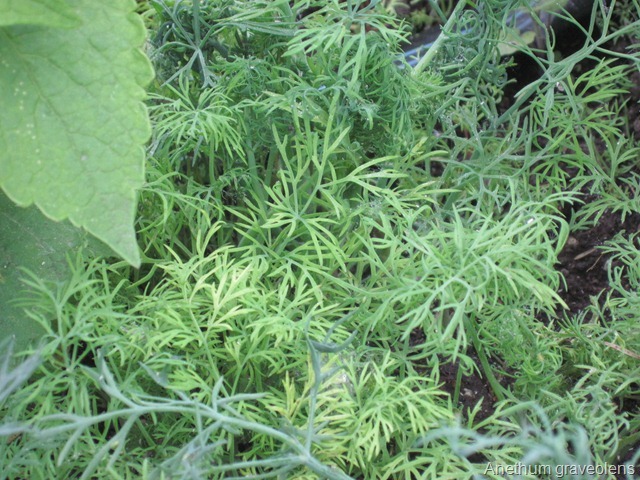 Fresh dill (Anethum graveolens) is one of my favourite herbs. I have never had much success consciously growing dill, however, a few years ago I let the dill in the garden go to seed and now I have more than enough dill (if there could ever be such a thing). It reseeds faithfully every year and together with sorrel and rocket is available to use early in the season. The leaves, flowers and seeds are all edible. The flowers are borne in umbrels on single stalks. This year due to the long, cool, wet spring, I am having an aphid problem. Aphids love dill. The foliage is so juicy and tender – it is hard to resist. You can start to harvest when the plants are 15 cm (6 inches tall). Take the largest, oldest leaves first. If the plant is young and still growing from the crown at soil level, these will be the outermost leaves. Do not take smaller leaves from the center, as these leaves are still growing. As the center stem grows, pick the leaves from the bottom of the stem first and work your way up by pulling the leaf downward to remove it from the stem. I agree with Thomas. I wonder if Aunt Sally ever shared that particular recipe. The following is just a guide. Use any herb or herb combinations you like. Dill butter is excellent on vegetables, fish or slathered on fresh bread. 1. Put butter in a blender, food processor or 2 cup mixing bowl. Add shallots, dill, vinegar, salt and pepper. Mix well. 2. Use immediately or roll into a cylinder or place in a mold. Wrap in foil and store in the fridge for one week or in the freezer for two months. Today I am shy on photographs. The camera ran out of juice after a couple of dill shots. You will have to use your imagination. For your entertainment, I am previewing a photo of my beautiful Rugosa Rose in full bloom today. 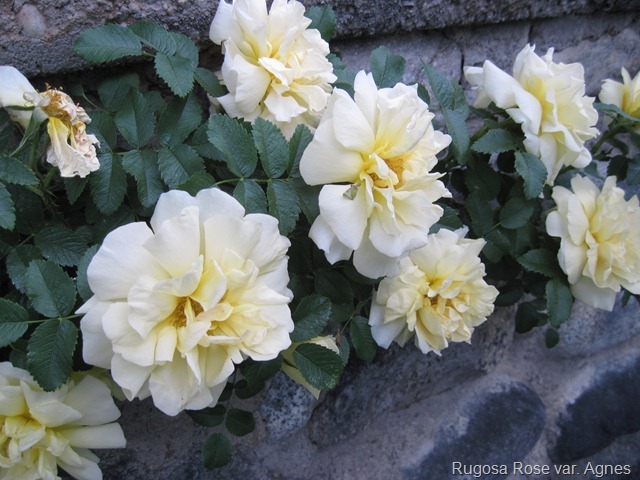 ‘Agnes’ is one of the few yellow rugosa roses, and it epitomizes the finest rugosa attributes in both leaf and overall form. Doubled blooms give it an old-fashioned aspect, as does its lovely fragrance reminiscent of antique roses. Sadly, its’ blooms are fleeting.